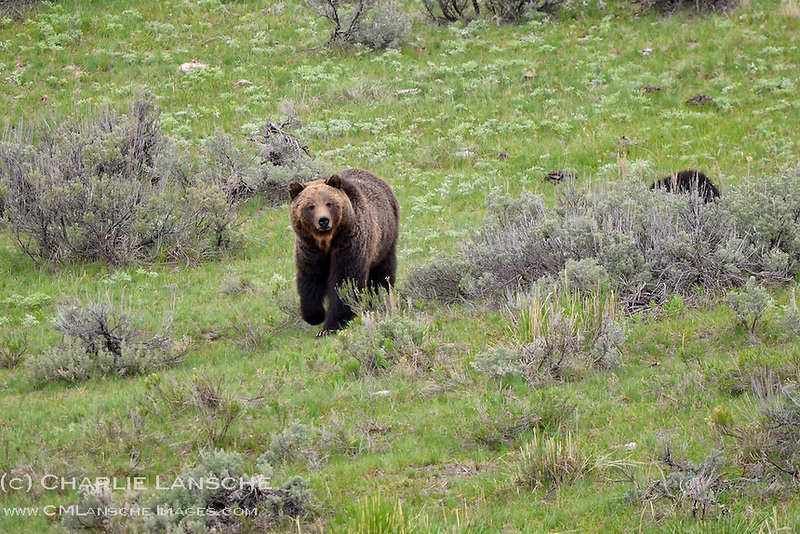 I believe this was the first time that I have made direct eye contact with a grizzly in the wild. It's a powerful experience to be in open country with an animal that is at the top of the food chain. I began watching her as she was a grazing several hundred yards above me in a meadow. She began methodically moving down the mountain, closer, and closer. This image was taken at about 100 yards and I am not certain that she fully recognized my presence as I hunkered on a rocky escarpment just above her. The wind was favorable but she was closing the gap quickly with two cubs. When she looked up in my direction it was clearly time to boogie -- although I waited for her to look away before I moved. A sow grizzly with cubs is indeed a dangerous situation and one to be respected. While I carry bear spray in griz country (biking an hiking), I never, ever, want to be so close as to use it.